was introduced to me many years ago as I was earning a BFA from Massachusetts College of Art. I fell in love with calligraphy when the first stroke of the pen hit the paper. Since then I have pursued it wholeheartedly as the art form that it is. Calligraphy has played an essential role throughout civilization. Scribes have heralded significant events throughout history with beautiful letters and passed down this art through generations, inspiring artists of today like myself. As a calligrapher I have commemorated moments in family lives: weddings, births, graduation diplomas, keepsakes and more. I have had the privilege to work with clients to memorialize events that are special to them and find great joy in this. I also enjoy finding meaningful sayings or quotes that inspire me. I love bringing to life these bits of wisdom and humor through letter arts, then offering them through my online store. This is my way of sharing the timeless and powerful expression that comes with a beautifully written word. Calligraphy is an essential element in celebrating life's most important moments. Births, Weddings, Awards, Citations, Custom Calligraphy and special occasions of all kinds become all the more memorable with the addition of beautiful, timeless lettering. Custom Baby Name Plaque... 8 x 10 with Mat to fit 11 x 14 frame. 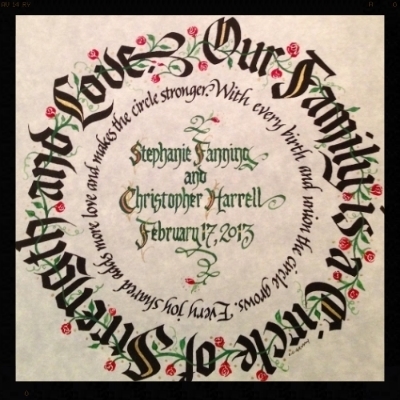 "Our Family Is a Circle" print with hand lettered personalizing... 7.5" square, matted to fit 12" square frame. Gaelic Welcome Print with hand embellishment gold leaf... 7.5" x 7.5" , matted to fit 12" square frame. Irish Blessing Print with hand embellishment gold leaf... 7.5" square matted to fit 12' Square Frame.